On Sundays we tend to have our ‘main’ meal now in the early evening, where we can all sit down and break bread together. We eat very little meat in the week these days, but on Sunday we like to indulge and have a roast or perhaps a curry. 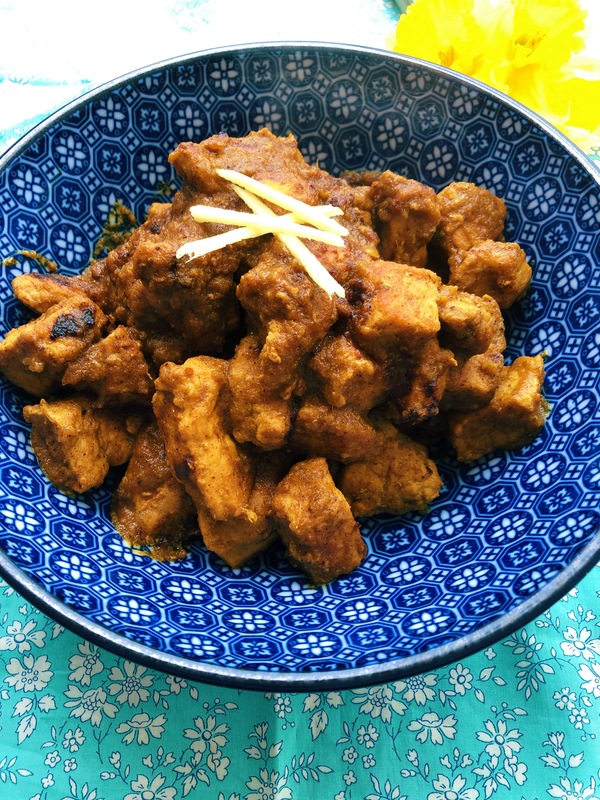 This evening we will be having a Goan pork curry, which is deliciously spiced – not chilli hot as my youngest daughter is 9 years old. It’s a great one you can make advance, either the day before or in the morning of the day you are making it. I’ll be accompanying it with some plain basmati rice and my beetroot curry. Do you have a main family meal on Sundays? Do you go for the traditional English roast or something more exotic? 1. Dice the pork into bite sized mouthfuls and set aside in a bowl. 2. Heat a frying pan and add the cumin seeds, red chillies, peppercorns, cinnamon bark, black mustard seeds and fenugreek seeds. Move around the pan so that the aromas are released but they do not burn. This will take under 1 minute. Place them into a small bowl to cool. Add the cardamom seeds to the bowl. 3. After a few minutes, place them into a spice grinder to create a masala. Return the powdered masala into the small bowl. 4. In the same frying pan, fry the onions until they begin to bronze. This will take around 10 minutes. 5. Whilst the onions are bronzing, peel the garlic and the fresh ginger (use the back of a teaspoon to do this – it is really easy this way), and grate the fresh ginger. Place in a hand blender, add a splash of water and blend to form a smooth paste. Place in a small bowl and place to one side. 6. Once the onions have bronzed transfer them to the same hand blender and blend until smooth. Add the vinegar to make the consistency smooth. 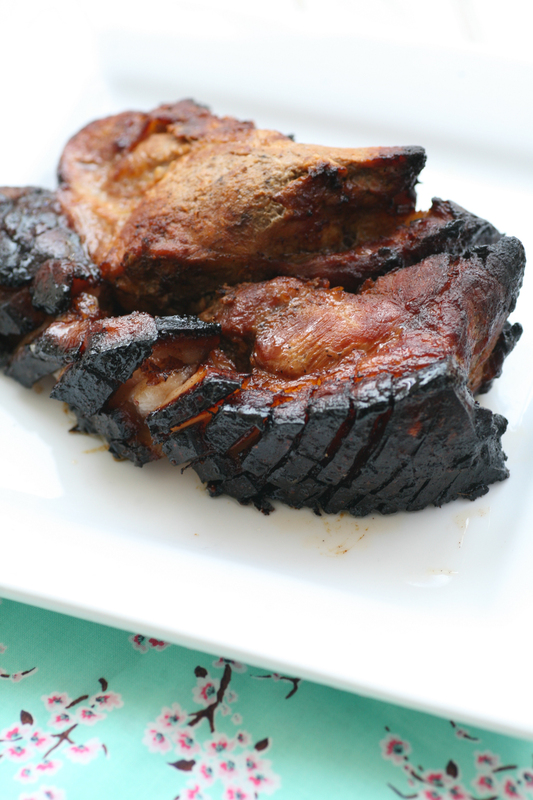 The reason for putting vinegar in this recipe is to help soften the pork when cooking. 7. 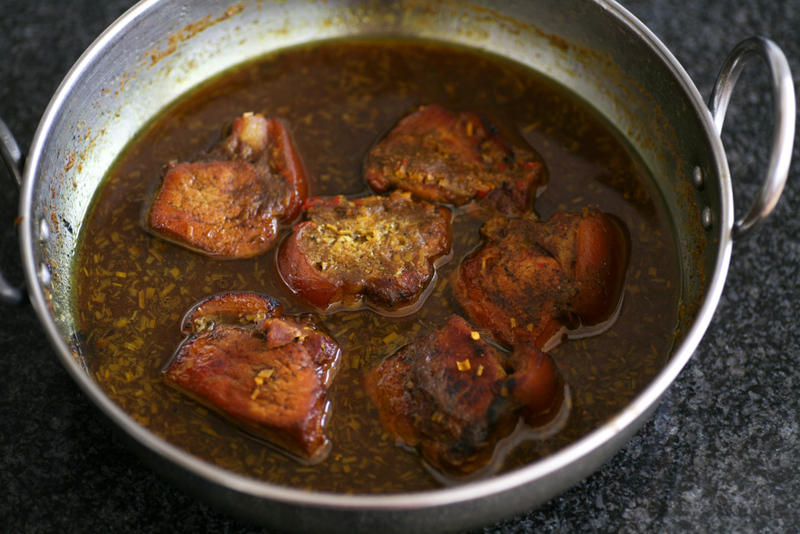 In the same frying pan, heat half the oil and gently fry the pork cubes so that they too begin to bronze. Remove with a slotted spoon. 8. In a new deeper pan, add the remaining oil and add the ginger-garlic paste you have created. 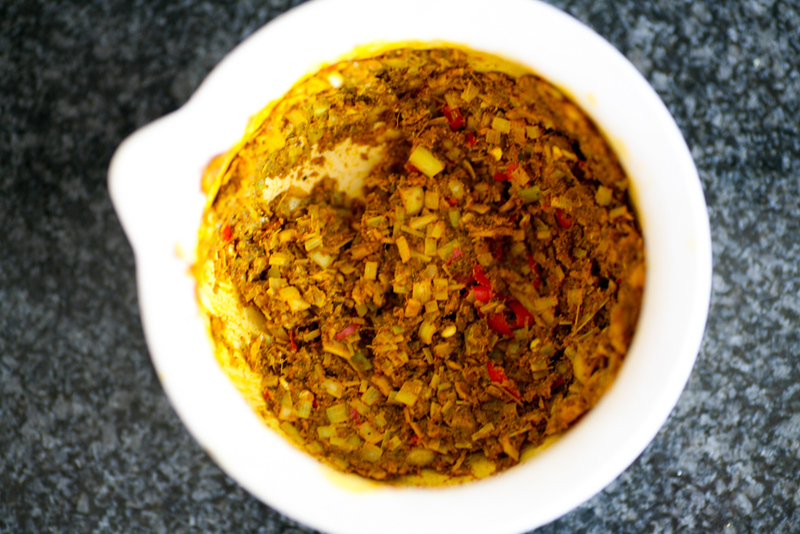 Add the turmeric and coriander powder and then return the pork to the pan along with the onion puree and masala blend. Fold all the spices into the pork. Add the water and cook on a low heat for 45-55 mins, stirring intermittently. I like to serve this with a simple plain basmati rice and a vegetable curry as a side dish. Luiz Hara has been on my culinary radar for a couple of years now. Word has it that he runs THE most exquisite supper clubs from his town house in Islington focusing primarily on Japanese, Nikkei and French cuisine. I’ve been procrastinating for far too long so I will definitely get my skates on in 2016 and give Luiz’s supper clubs a go. He is also the man behind the successful food blog, ‘The London Foodie’, which focuses on food, wine and travel. Most recently however he has published his very first cookbook called ‘Nikkei Cuisine – Japanese Food the South American Way’. It sounds intriguing right? Nikkei cuisine is the cooking of the Japanese diaspora. Japanese immigrants often found themselves in countries that had very different cooking techniques and ingredients to what they were used to. 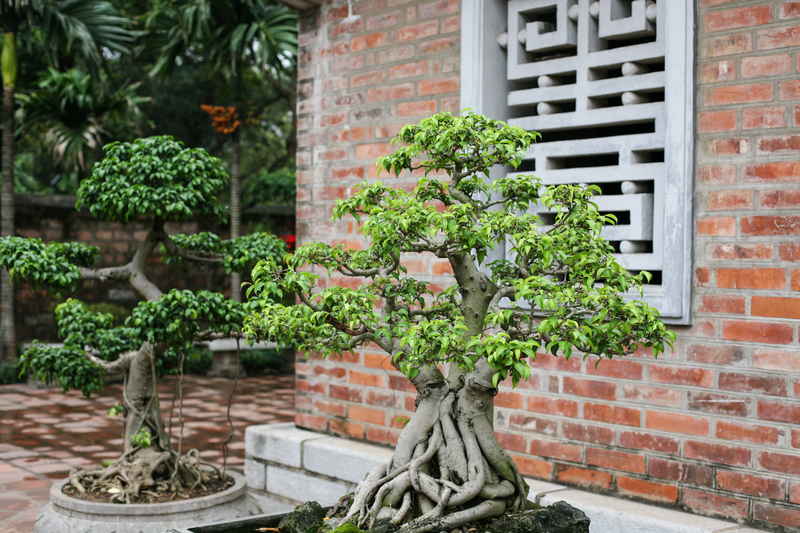 They had to adapt to their new surroundings but at the same time wanted to continue using Japanese techniques and traditions. The resulting cuisine is called Nikkei. To say ‘fusion’ would be wrong and Luiz goes to great lengths in his introduction to explain Nikkei cuisine and how it is a very distinct cuisine in its own right. He explains “Nikkei cuisine is a byproduct of migration and adaption, created over 100 years ago in South America. It was a cuisine created out of necessity”. Outside Japan the highest contentration of Japanese live in South America, namely Brazil and Peru. It was in Brazil that Luiz’s family finally settled and became part of the Nikkei community. The cuisine has been part of his family history and is certainly no food fad. Luiz himself moved to London for university after which he worked in Finance in the city. Much like myself he created his blog ‘The London Foodie’ as a creative outpost for this food thoughts and exploration. It was love of food and cuisine that they led him to quit his day job and embark on a new chapter in food. He trained at Le Cordon Bleu, where he graduated with the Grande Diplome in 2012. It was following his training and some time spent in Japan learning from the masters, that he then opened up his own home to friends and strangers by hosting his supper club. As well as continuing to this day with his supper club, he teaches cooking and writes in many national and overseas publications on the topic of food and travel. Which brings us to the book itself. To say that it is a feast for the eyes as well as the belly is a massive understatement. 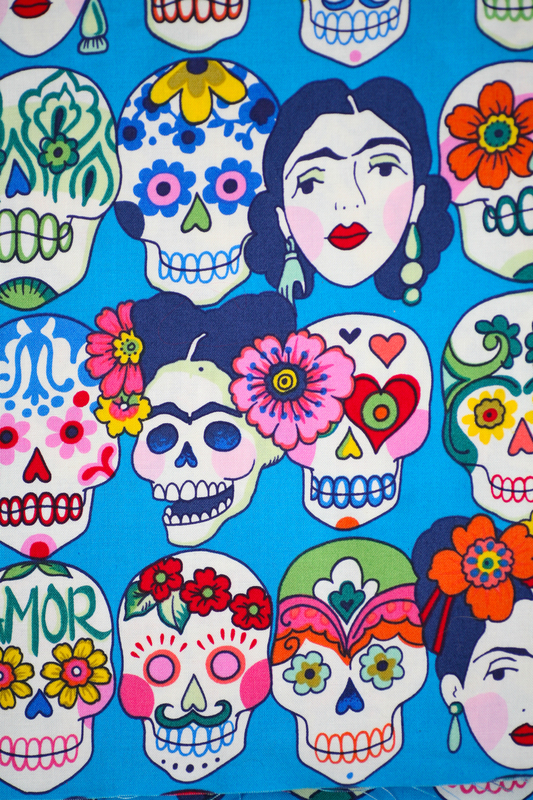 It’s colourful, bold and exciting. It’s the type of book that is perfect for confident homecooks or for those who like to be pushed in their abilities. I recall some people grumbling over the ingredients lists of the hallowed books from the Ottolenghi empire, but for me this was a revelation and not something that phased me in the slightest. Luiz’s book must be treated with the same respect. Yes, it requires a bit of thought and forward planning, but with the help of some wonderful Oriental supermarkets in the UK and online, it is not too difficult to create the dishes. Luiz even lists a ‘directory of suppliers’ in the back of the book to help you if you are unsure where to buy certain ingredients. He also lists all the ingredients you may be unfamiliar with and gives an overview about each one. The sound of the dishes coupled with the stunning photographs in the book (see above photos) really inspire you to try cooking these yourself. How about duck breast robata with pickled pearl onions and sancho pepper vinaigrette or salmon and passion fruit tiradito with crispy butternut squash and espelette pepper or Nikkei hotpot of pork belly, cod and seafood? Mouthwatering hey. Word of warning, never read this book if you are feeling hungry as it will make matters a whole lot worse believe me. The amount of pork I used. He said 300g and I used the whole pack of 500g. Unless you go to the butcher, most packets of pork mince in the UK are 500g, hence I decided to use the lot. I also used vegetable bouillon instead of Asian chicken stock. I went to Korea Foods and when I asked for Asian chicken stock the guy showed me what looked like a regular chicken stock but with Chinese writing all over it. This was probably the Asian chicken stock that Luiz was referring to but the packet was so large I decided that I would replicate it with my regular vegetable stock. I would recommend you suggest cooking the aubergine for nearer 7 minutes as opposed to 5-6 as you want to make sure that the aubergine is properly soft inside. For speed I opted for ginger paste instead of fresh ginger! I used reduced salt soy sauce. The recipe was really very straightforward and I would most definitely cook it again. Flavoursome, with great balances of salty and sweet with only a hint of chilli. 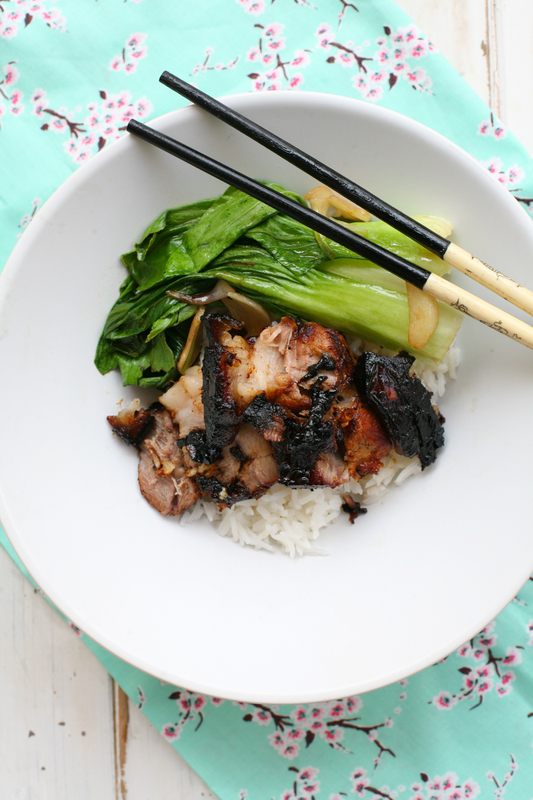 First start by making the pork soboro. Place the sesame oil in a pan and when it is hot add the pork mince and allow to brown in colour (this will take around 5 minutes) before adding all the rest of the ingredients in the list for the pork soboro. Cook on a medium heat for around 20 minutes or until all the liquid has evaporated. Leave to cool on one side. Cook the dried rice vermicelli noodles according to the packet and when cooked through, drain allowing cold water to run through the noodles. Add the fresh coriander to the noodles and place to one side. Next you need to make the dressing by adding all the ingredients together in a mixing jug. Place to one side. Using a pan bigger enough to hold both aubergines gently heat up some sunflower oil. You want to fill the pan up to half way with the sunflower oil. Clean the aubergines and make a few delicate incisions into each aubergine to prevent them from bursting in the pan. Gently place the aubergine into the hot oil. Gently turn the aubergines over every minute and allow them to cook for 7 minutes. Get a large bowl of cold water (pop in some ice if you have any). When the aubergines have cooked for 7 minutes, plunge them into the iced cold water. They will immediately shrivel up. Once the aubergines have cooled, peel their skin. It will come away really easily. Now cut the aubergine lengthways so that you have 4 pieces. Take one aubergine section and cut it lengthways on the diagonal. Place both sections onto a serving plate. Place a portion of the noodles across the centre of the aubergine on the diagonal. Layer the pork soboro on top and finish off with some of the dressing, sesame seeds and shichimi pepper. Luiz suggests eating it at room temperature, which I did. All the elements of the dish can be prepared in advance, which is always a bonus if you are entertaining. Please don’t be put off by the lengthy ingredient list. From start to finish this dish will not take longer to prepare than 30 minutes. It really is very tasty indeed. With the clocks having gone back last weekend, the nights are drawing in earlier and winter seems almost knocking at our door. 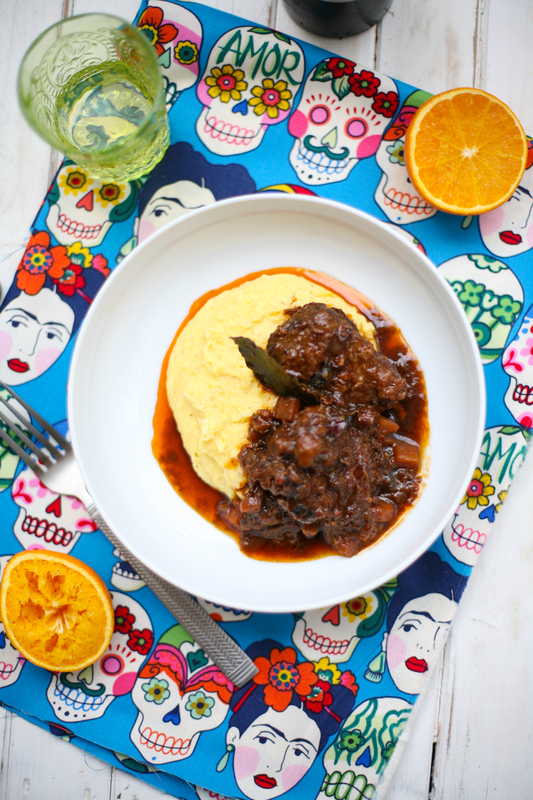 With the colder months set out before us, hearty food comes into its own. It’s with this in mind that I came up with this wintery of dishes. The type of meal that you can only really do justice to after a long bracing walk. 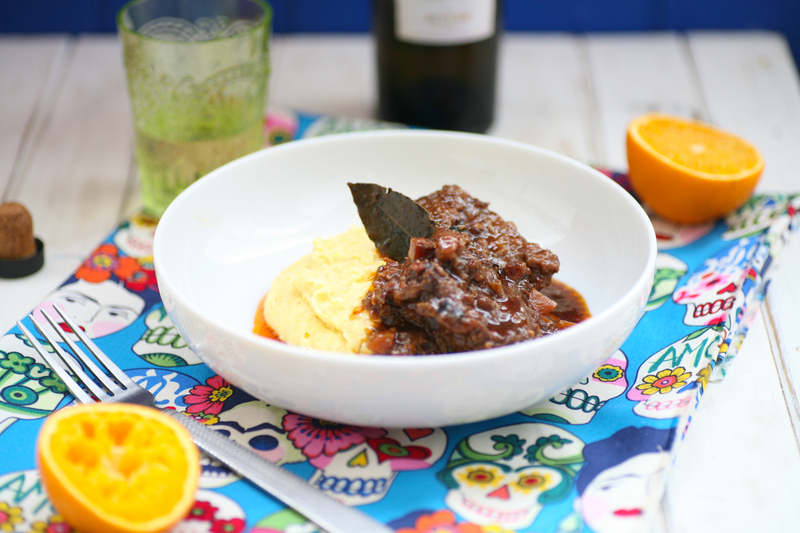 Pork cheeks, if you have never tried them before, are flakey, succulent and a real treat to have now and again. I cook them at a low temperature (130 degrees) for 3 hours, which gives a similar texture to pulled pork. 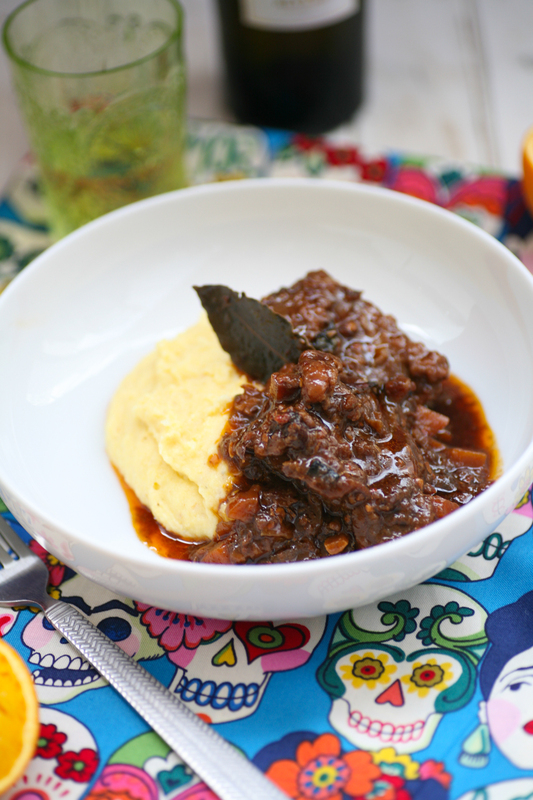 I have combined them with a Mexican influenced sauce, which envelopes the pork cheeks making them irresistibly tasty. 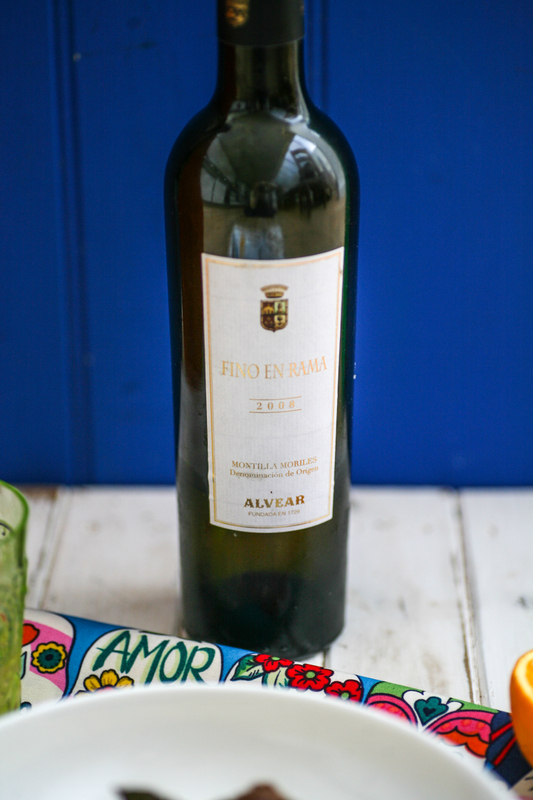 I have paired the dish with a glass of Fino, which cuts through the sweet, sticky richness of the pig cheeks sauce. I ordered both the pork cheeks and Fino from Basco Fine Foods, which are Spanish food importers and supplies based in Yorkshire. They have won many gourmet food accolades and have a wide selection of really tasty food and drink, perfect for the Christmas season. They are well priced and even do next day deliver, which is a real bonus. 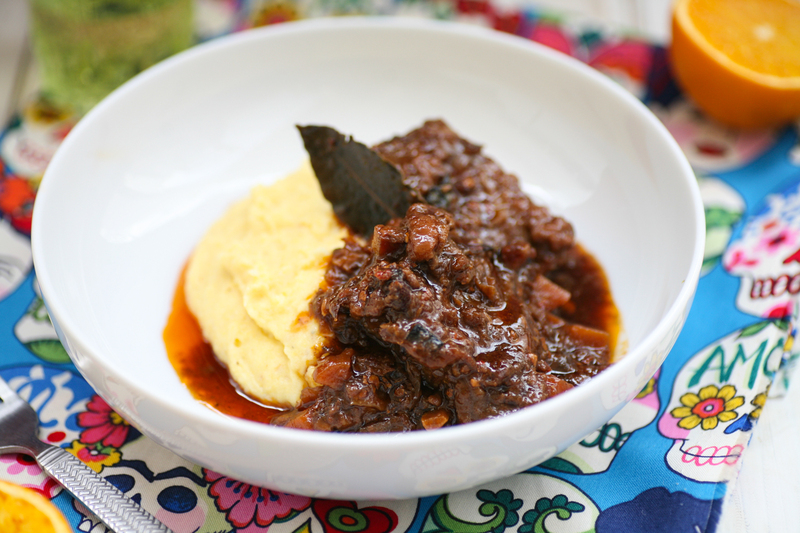 I have paired the pork cheeks with creamy polenta, which is the perfect partner to soak up all the tasty sauce. I know polenta divides people but please trust me when I say it really comes into its own in this dish. So I hope you get to give this one a go over the winter months. Let me know how you get on and if you are on instagram take a photo of it and use the #chilliandmint and tag me @chilliandmint so I can see. It comfortably feeds 6 people as you’ll find that two pig cheeks are very filling. Preheat an oven to 130 degrees. Place the dried chipotle chillies in a pan of boiling water so that they are covered and simmer for 30 mins. Place some plain flour on a plate and then dust all the pigs cheeks. Heat a large pan and add a little vegetable oil and bronze the pigs cheeks in batches. This will take a couple of minutes on each side. Place to one side to rest. In the same pan add a little more vegetable oil and add the cumin seeds followed after 20 seconds by the red onions and salt. After 5 minutes add the carrots and garlic and simmer gently for a further 5 minutes. Meanwhile drain the chipotle and remove any seeds. Using a blender, blend them into a smooth paste. Add the cinnamon stock, bay leaves, tomato puree, chipotle paste, both vinegars, the Fino En Rama, fresh oregano and demerara sugar. Return the pig cheeks to the pan and coat them in the sauce. 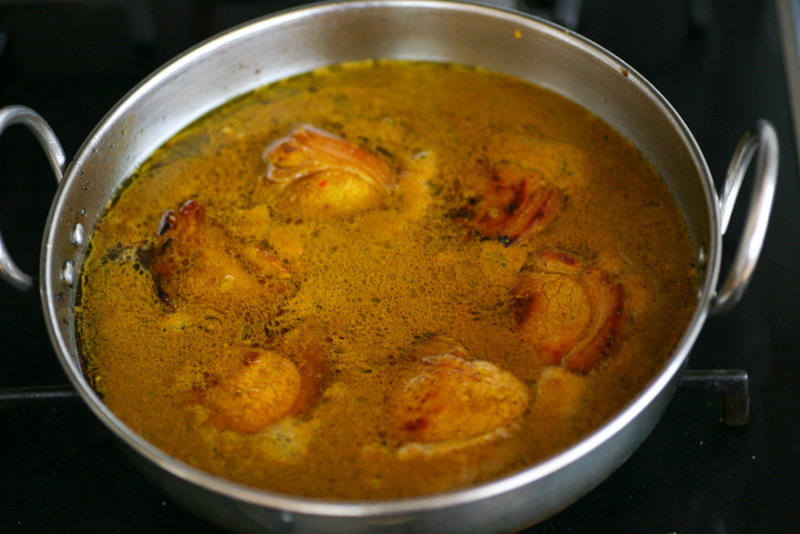 Add the vegetable stock so that the pig cheeks are submerged and place them in the oven for 3 hours. Heat the milk and water in a pan and add the salt. When the milk/water has boiled add the powdered polenta and whisk so that it become smooth and mixes completely with the water/milk. Whisk every few minutes, on a low heat, for 10-15 minutes so that the polenta remains smooth. Add a little more milk if you feel it is a little too thick. It will begin to come away from the sides. Taste to see if it is done and serve immediately. Note: This post was kindly sponsored by Basco Fine Foods. Savoury food for breakfast has always been my kind of thing. Other than the pain au chocolat craving I had when I was pregnant with my first, savoury food has always been my go to breakfast choice. As such Asian food in general is my idea of heaven. Curry for breakfast, a bowl of hot steaming Vietnamese pho or Vietnamese Bahn Xeo (Vietnamese pancakes), and I am in culinary nirvana. 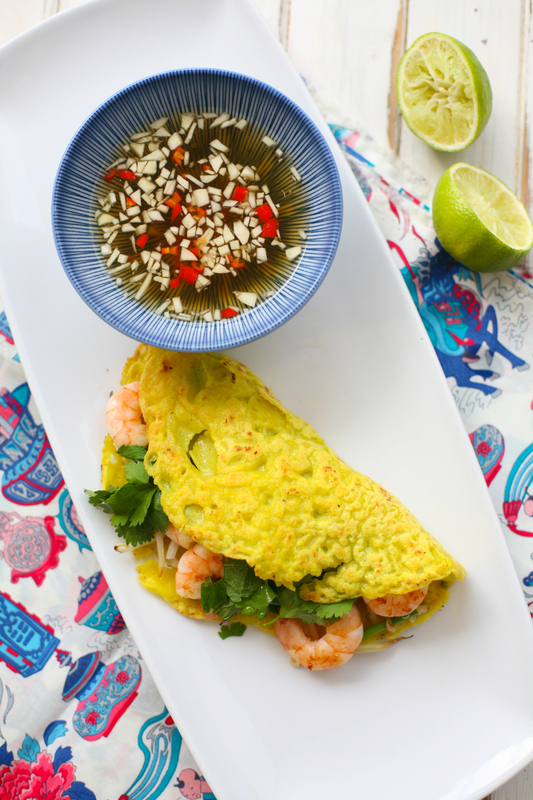 These kind of foods I could eat all day so I am not necessarily suggesting you start cooking Vietnamese pancakes before the school/office run but having the recipe in mind when you want to try something new at any time of day. Banh Xeo (pronounced Ban say-oh – see video below if you want to sound like a pro) are thin crisp pancakes made with rice flour, coconut milk (or beer in fact), turmeric, and water. Traditionally they are filled with both pork (thinly cut pork belly strips) and prawns, but for mine I have omitted the pork and used just prawns. If you are vegetarian you could equally use some fried tofu, which would taste really good. 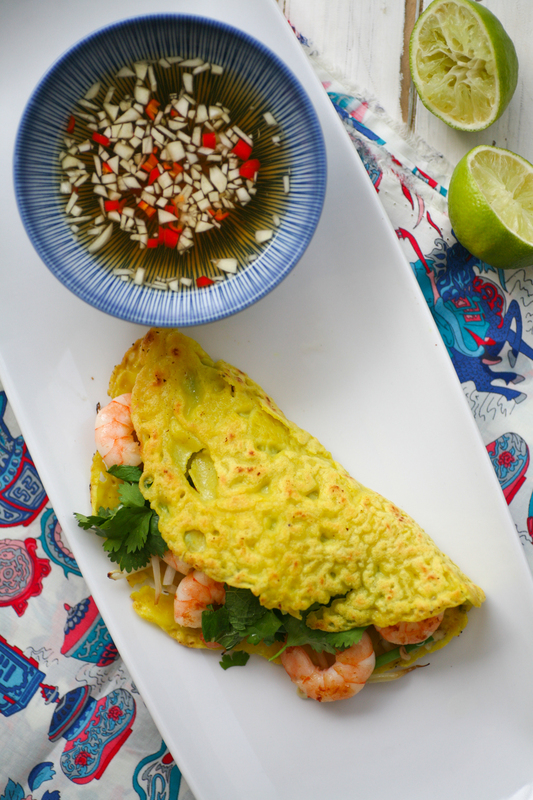 Xeo actually means ‘sizzling’ in Vietnamese and it is this sound that you want to hear when the pancakes are crisping up. They are also known as ‘happy pancakes’ and you’ll see why after you have tasted your first mouthful. I pick up my rice flour from my local Asian supermarket or you can easily buy it online, it’s also only a matter of time before the bigger supermarkets will start stocking it too. 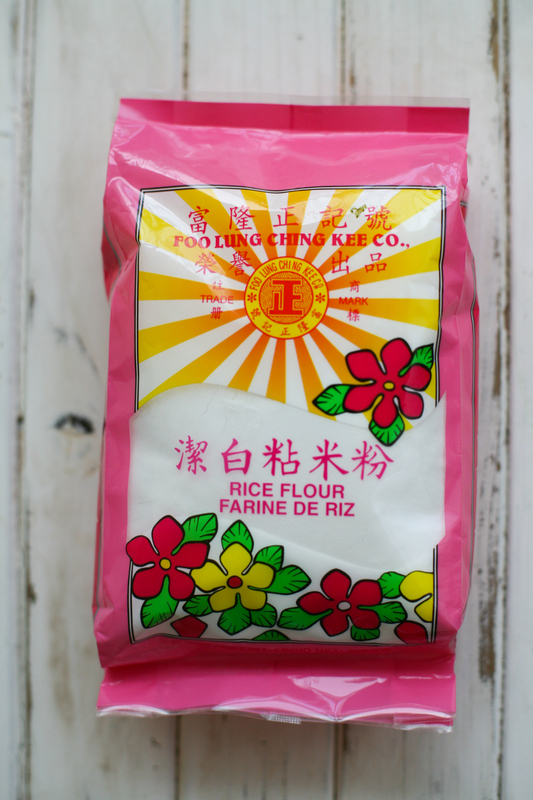 I rather love the packaging of the one that I use – it’s got happy flour written all over it! 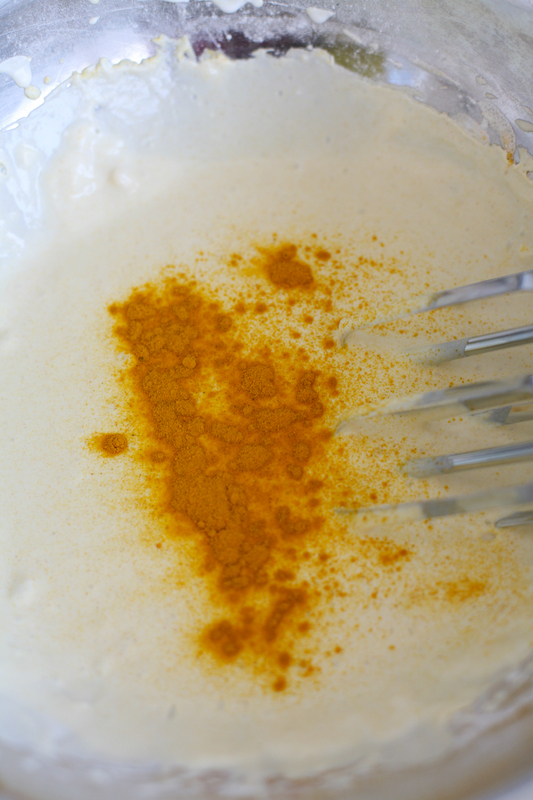 The turmeric gives the lovely bright yellow hue to the pancakes and I also put in coconut milk. Some central parts of Vietnam do not use coconut milk and instead opt for beer to give the pancakes an extra crispiness, but I personally love the coconut taste to the pancakes. 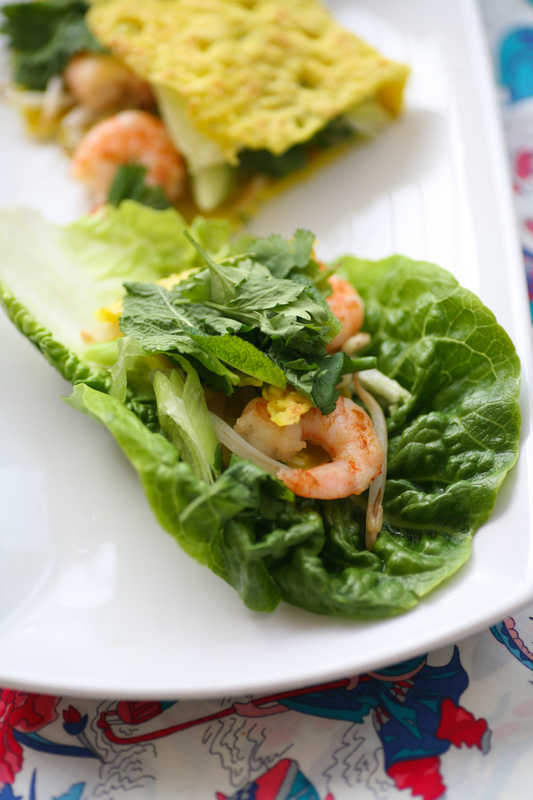 and then place it on the lettuce leaf, along with the herbs …..
and then roll it so you are able to pick it up and dip it in your nuoc cham dipping sauce. Easy hey. I cannot stress how delicious this is, so much so that I am craving more of these writing this post. 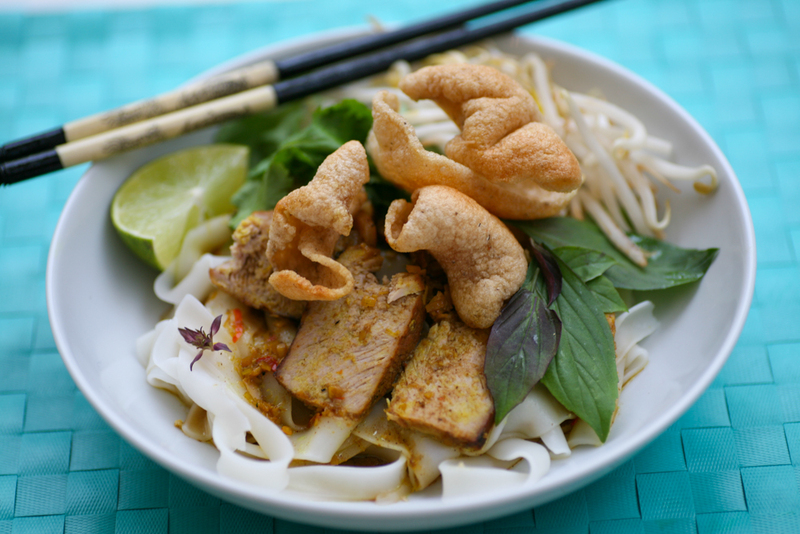 Seriously seek out rice flour and give these a shot – I promise you you won’t regret it. 1. First you want to make the batter. Mix all the ingredients together with a whisk so that the mixture is smooth and not too thick in consistency. You want to make it a similar consistency as if you were cooking regular European pancakes. Place to one side to rest ideally for at least 30 minutes. 2. 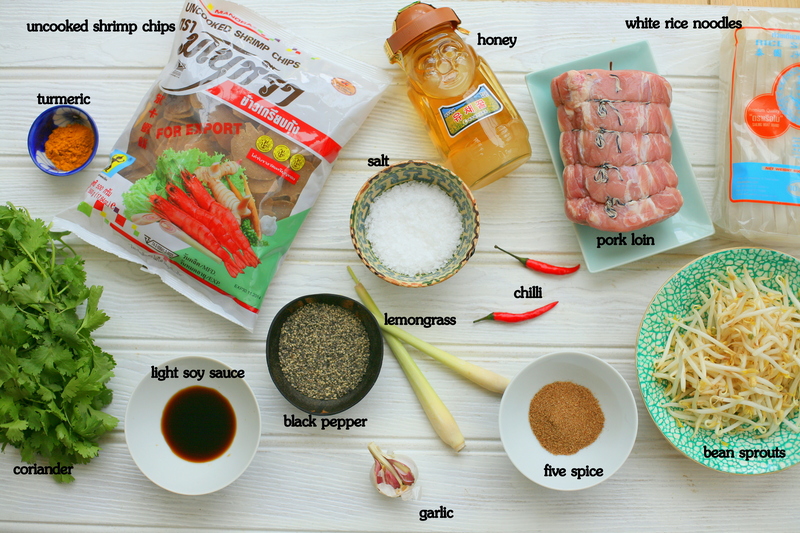 To prepare the nuoc cham dipping sauce place the garlic and chilli in a bowl followed by the water, sugar, fish sauce, vinegar and lime (if using). Stir well so that the sugar dissolves. Place to one side. 3. Next prepare the filling. Place a small amount of coconut oil in a pan and cook the prawns on a medium low heat for 3 minutes, turning and stirring as you do so. Once they have become pinker in colour, transfer them to a plate. 4. Heat a large non stick skillet or frying pan and when it is hot add 1 tsp of coconut oil (or ground nut oil) and then ladle in one spoonful of the pancake mixture. Move it around the pan immediately so that it is completely covered. Lower the heat and let it cook for 3 minutes. 5. Place some beansprouts over one half of the pancake, along with some spring onions and place a lid on the pan for a further 2 minutes. 6. Now remove the lid and place the prawns on top of the beansprouts and spring onions. Cook for one more minute checking to see that the underside of the pancake is beginning to bronze slightly and crisp up. 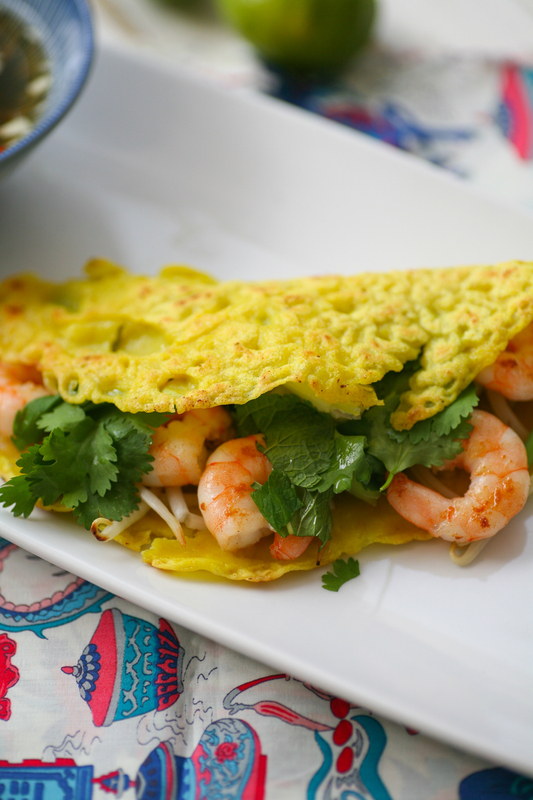 Place some fresh coriander, mint, Thai basil on top of the prawns and then fold one half of the pancake over the other. Leave to cook for 20 more seconds and then place on a serving plate with more fresh herbs and some lettuce. Serve immediately when it is hot. 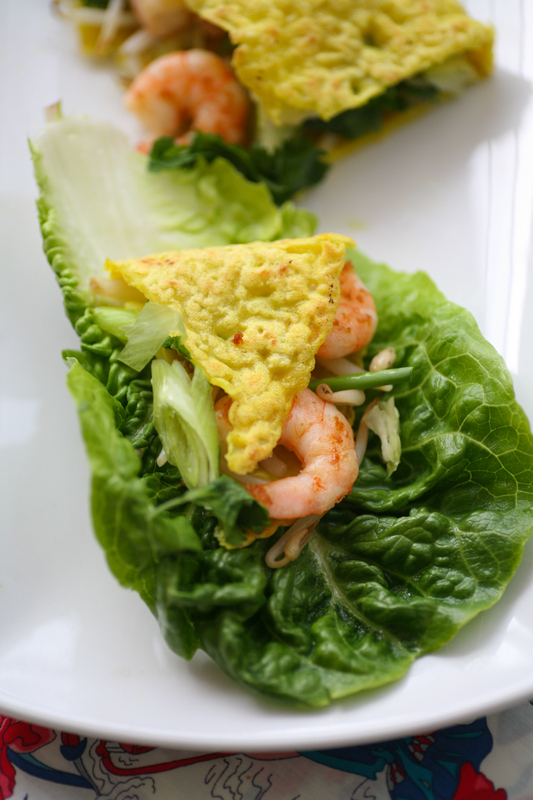 Cut a bit sized portion off the pancake and place on a lettuce leaf. 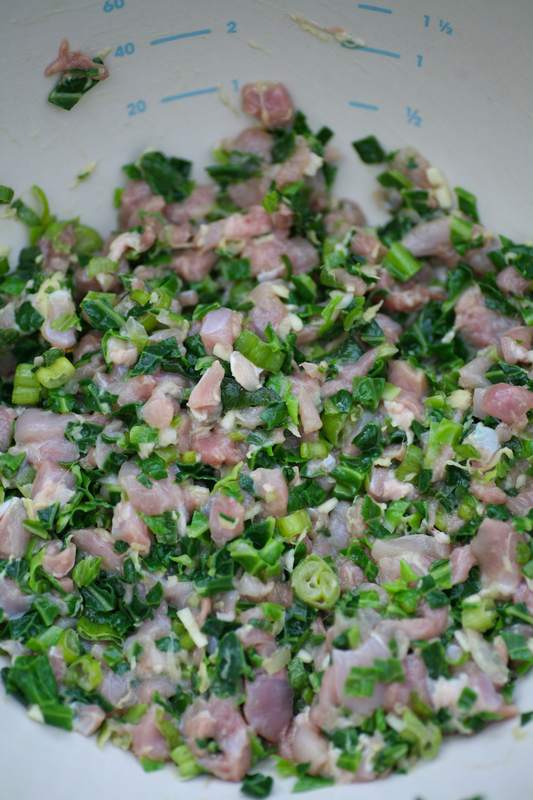 Add a few more herbs and then roll so that you can pick it up and dip it into the nuoc cham dipping sauce. The video below shows you how to eat it. 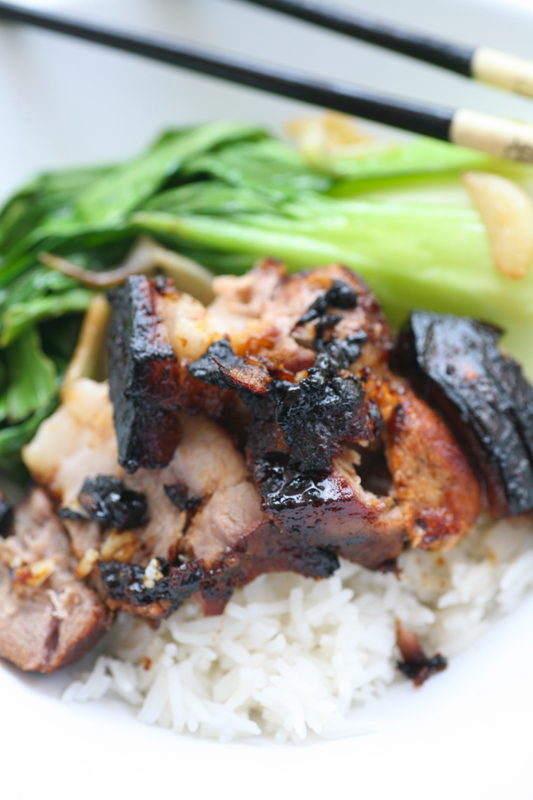 As an alternative to a typical English Sunday roast I thought I would tempt you with a Chinese spiced alternative that is sticky, sweet and balances perfectly with the saltiness from the pork and crackling. It’s a real family crowd pleaser and I can guarantee you all the plates will be completely clean after everyone has devoured their portion. 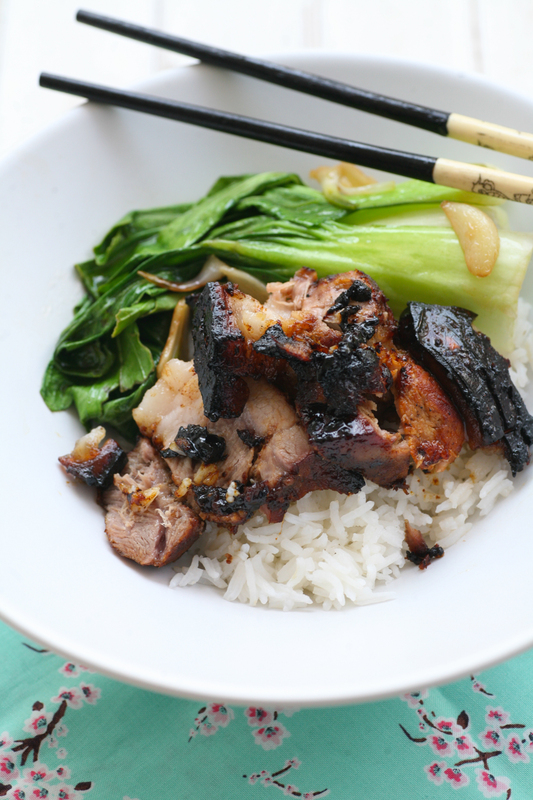 This time I served mine with pak choi and some white fluffy rice, but you can equally serve with mangetout, green beans, Chinese greens, noodles – the list is endless. Take a look at these close ups and you can almost smell the five spice and the honey from looking at these glorious hunks of meat. With the juices from the meats you can quickly make a little sauce to run all over the meat and rice (the sauce was made just after these photos were taken so you are going to have to imagine the meat with a little bit of dark sauce running all over it). 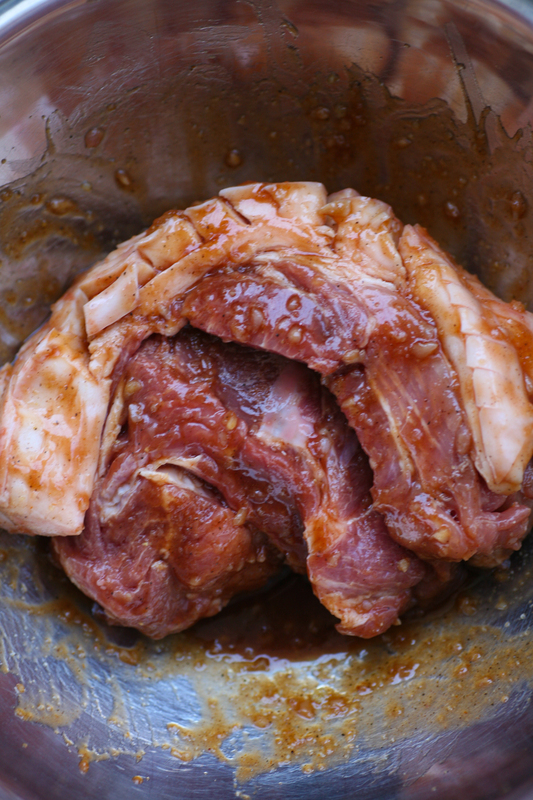 The meat requires as much marinading as you can manage. This time I only managed about an hour – kept at room temperature, but if you are super organised you can prepare it the night before and leave it in the fridge over night and then bring it out in the morning so that it is at room temperature when you place it in the oven. Before marinading the meat make sure your butcher, or you, has scored the meat so that there is a deep lattice effect running along the top of the fat. Once this is done you can then cover the meat in the marinade. Make sure you use your hands to massage the meat and skin. After cooking don’t worry if the crackling looks a little black (see photo below) – it’s meant to. The sauce has darkened the meat and the crackling to perfection. Let it rest for 10 minutes under foil before cutting up. 1. 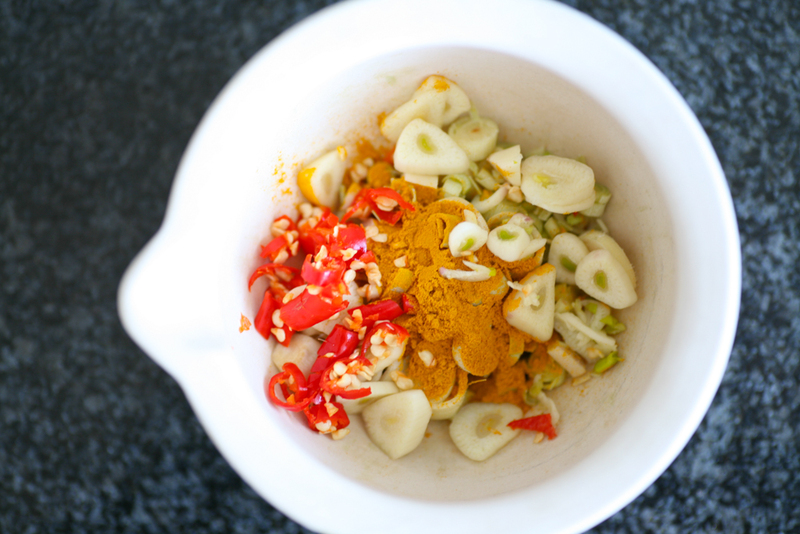 First marinade the pork with the ingredients above either for an hour or if you are super organised, overnight. 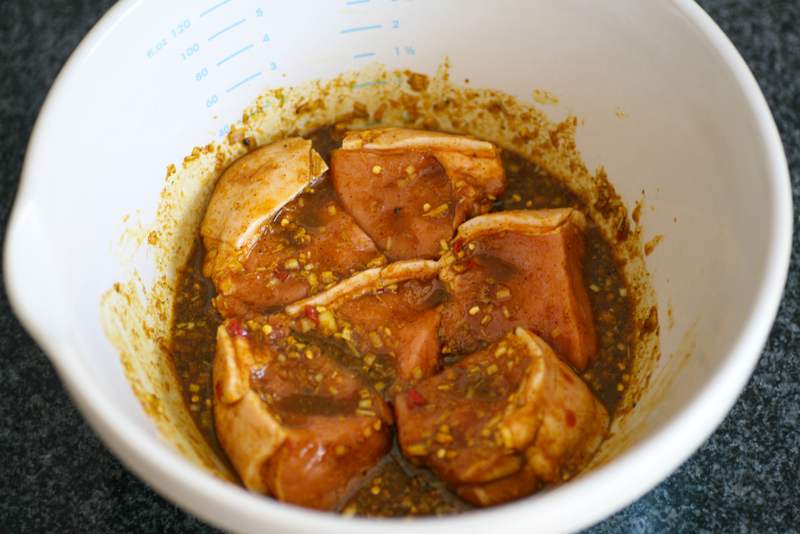 If you are marinading for an hour, leave the pork marinading at room temperature. 2. Preheat the oven to 200 degrees (180 degrees if using fan) and when the oven is hot place the pork on a roasting tray in the middle of the oven. Cook for 1 hour turning the pork over after 30 minutes of cooking time. 3. If after about 50 minutes the crackling has not crackled sufficiently increase the temperature of the oven to 200 degrees and cook for 10 minutes by which time the fat will have crackled to perfection. 4. Remove from the oven and then cover with foil for 10 minutes to rest on a warmed plate. 5. Prepare the rice or noodles so that they are ready to serve in 10 minutes. 6. Meanwhile to make the sauce, scrape all the gooeyness from the bottom of the roasting tray and add the honey, soy sauce and water. Stir so that all the ingredients mix well together. Simmer for a minute and then pour into a warmed sauce jug. 7. 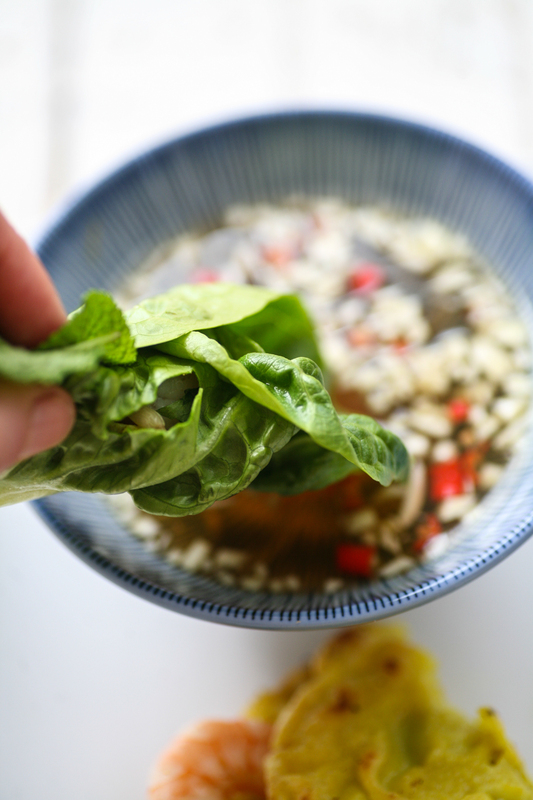 In a separate large pan, gently fry the garlic in the sesame oil for 2 minutes and then add the washed pak choi. The pak choi will wilt slightly within a couple of minutes, but which time it is ready to serve. 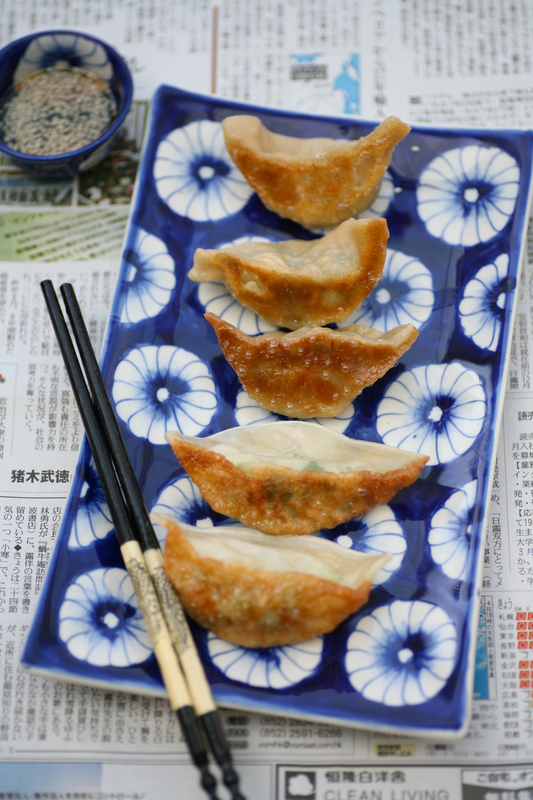 Mention the worked ‘gyoza’ in my household and you will hear yelps of delight – and that’s not just from the children. 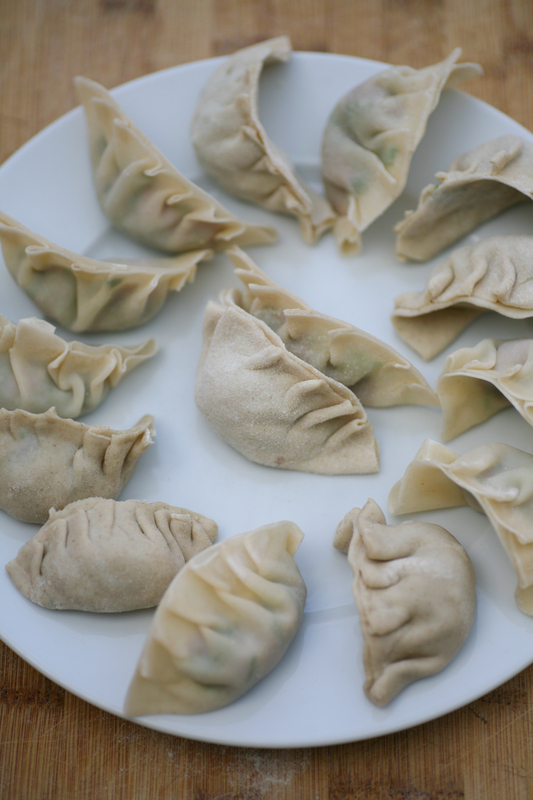 These moreish savoury dumplings are incredibly addictive and are a great little starter or snack, although you can off course have them as a main meal along with some steamed greens with soy and garlic perhaps. Japan and China both have their version of the dumpling, although these dumplings first originated from China and were then adopted by the Japanese. 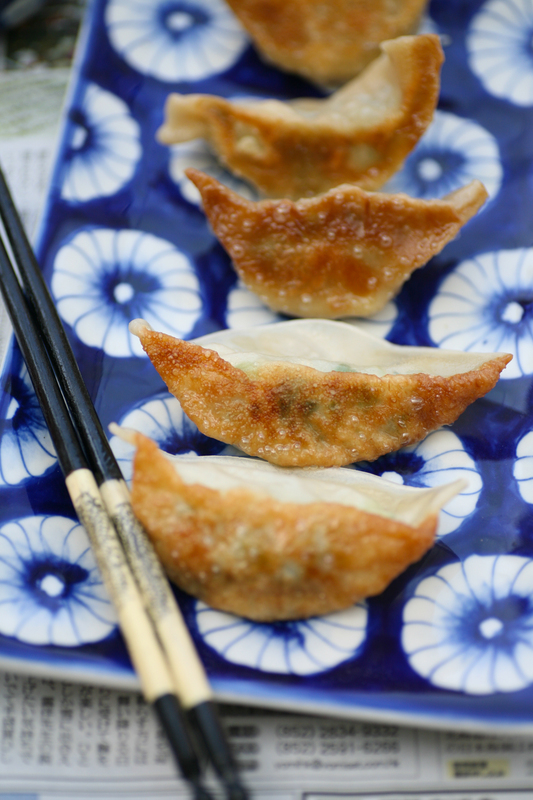 The Chinese dumplings are known as jiaozi if they are boiled or steamed and guo tie if they are fried, in Japan – gyoza and the US – pot sticker. The Chinese variety have slightly thicker wrappers and have a far wider combination of fillings than their Japanese counterparts. They are often steamed, whereas the Japanese gyoza are fried for a few minutes and then steamed for a further few minutes. The fillings I typically use for the vegetarian are tofu and shiitake mushrooms, or the meat variety filled with pork, chicken or duck or the seafood version, which tends to be prawn. Whatever takes your fancy these little dainties will be forever cherished by those who sample them. Now the question is to lovingly prepare your own wrappers or to buy some from your local Asian grocers or online. Basically it will come down to time on your part. Making your own takes a little time, but its the perfect activity to do with a mate who comes over for coffee – just rope them in they’ll love the experience or even with the kids. Shop bought is pretty cheap, as you can see for the price sticker I left on above, and are likely to be more uniform in thickness, but I’ll leave it to you to decide which suits your lifestyle. For those who wish to make their own it is SO simple. Seriously you only need a couple of ingredients and then a bit of kneading. 1. Stir the salt into the warm water until it completely dissolves. 2. Place the sieved flour into a large bowl and add the warm water. Using a wooden spoon mix the flour and water together and then use your hands to create a ball. 3. 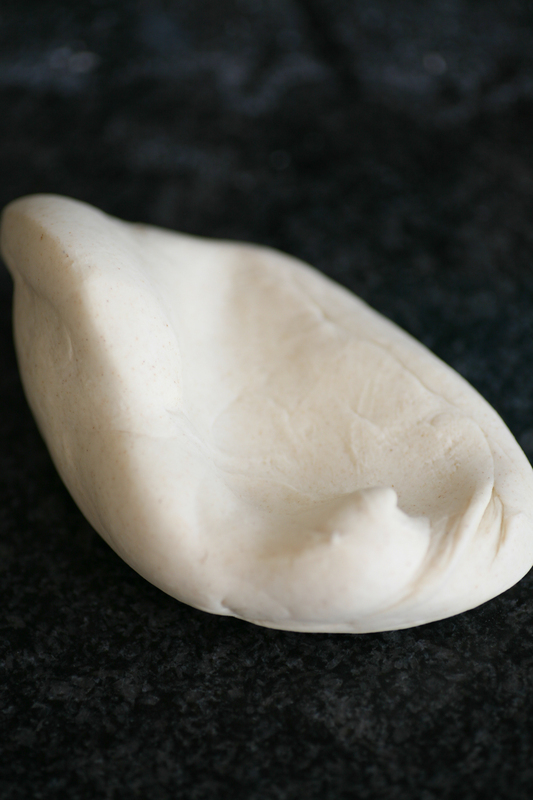 Kneed the dough on a cold surface for around 10 minutes, when it will be soft and springy to touch. Sprinkle more flour onto the dough if it is getting too sticky. 4. Wrap in cling film and place in the fridge for 30 mins. 5. Take small balls of the dough – about the size of apricot – and flatten it with your hand. 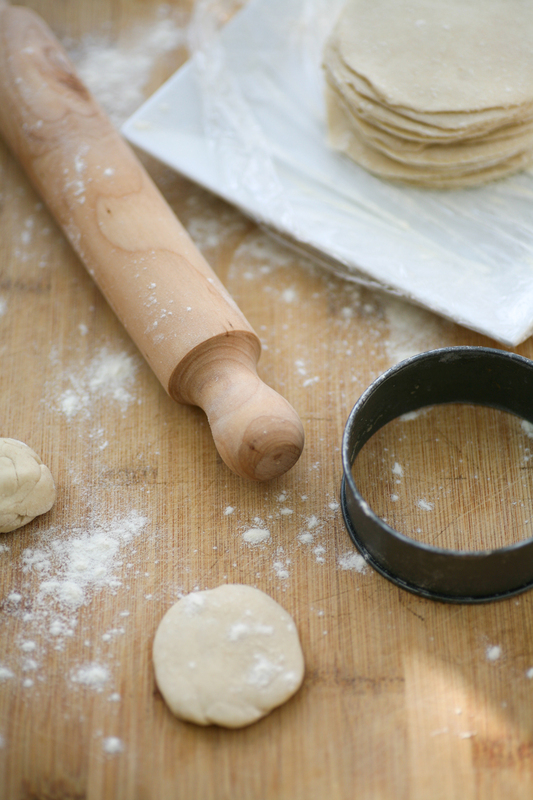 Gently roll the dough into a round shape, turning it after every roll. Using a round cookie cutter (or the bottom of a saucer) cut out a round circle and cover gently with flour and place in a pile. 6. Continue until the dough has been used up. You should make around 20 dough wrappers with the proportions above. Whilst you prepare the filling place a damp cloth over the wrappers so they do not dry out. So now you have the wrappers ready to go you need to prepare the filling. Whether you want to use chicken, pork mince, prawn, duck or shiitake mushrooms and tofu the rest of the ingredients remain the same. Whilst using Chinese cabbage is the most authentic, use whatever green cabbage you have in your fridge. Place two large leaves in a pan of boiling water for 1 minute and then drain and pat completely dry with kitchen paper. You then want to slice and cut them up as small as you can. You can blitz everything in a blender but I tend to often take the slightly slower version of cutting by hand. Today I used chicken and as I tend to find minced chicken hard to source so I bought boneless chicken thighs and cut up them up into small pieces. I also added spring onions, chopped garlic, finely grated ginger, soy sauce, sesame oil, salt and pepper and hey presto you have your filling. You can get creative and add any other ingredient you think might work – how about carrot, fresh chilli, five spice. 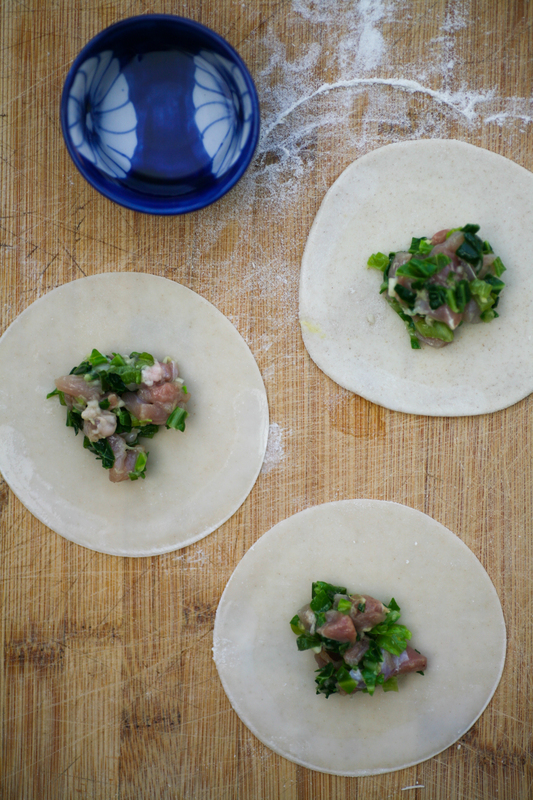 Wrapping the dumplings is rather satisfying and you will begin to get into a rhyme with them. 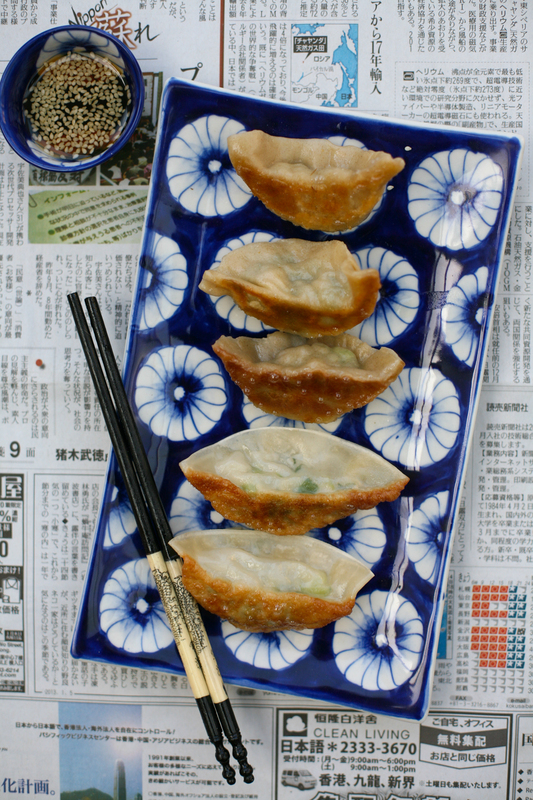 Don’t overfill the gyoza, instead putting a teaspoonful in the centre and then, using your finger tip, wet the low half rim of the circle. 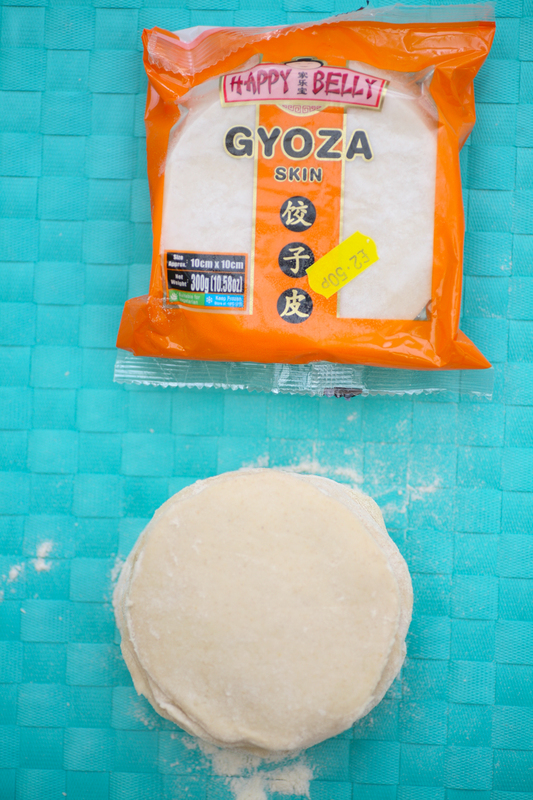 You then want to fold over the gyoza in half and then begin to pleat from left to right, making sure the filling is securely inside the parcel. It is definitely a case of the more you do the better you become. My 8 year old is a complete natural and can do multiple pleats across the top. 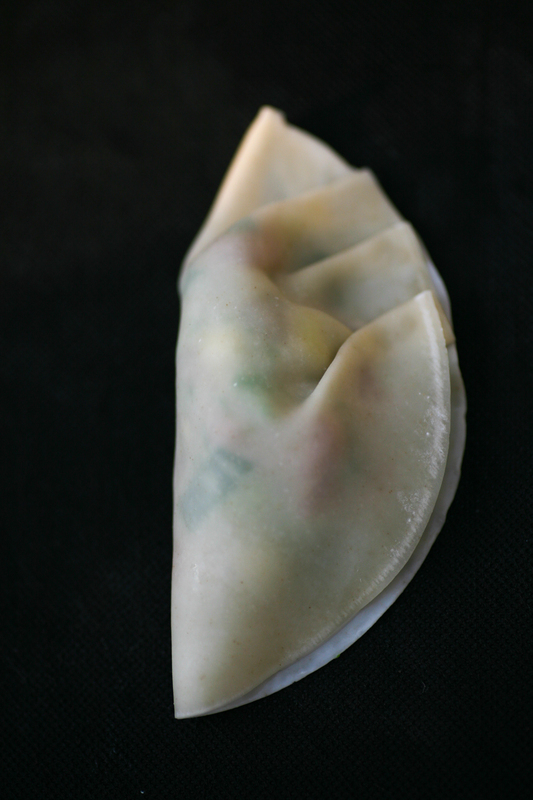 You only pleat one side of the gyoza s0 do not turn over and attempt to do more on the other side. The above photo shows half of the gyoza pleated. I finished doing this row, but did not turn it over to attempt to do the other side. To pleat you simply use your thumb and forefinger to make small pleats going over the last. Make sure you press the top together so that it is firmly stuck together – you don’t want them opening up in the pan. So you can see some are neater than others above. 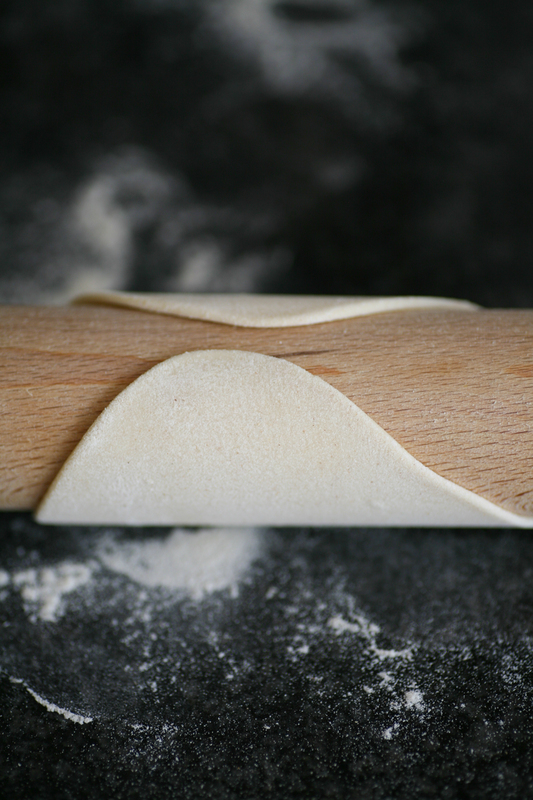 They will still taste delicious even if you haven’t got the perfect symmetrical pleating! 1. Finely chop all of the ingredients and then bind together using your hands. 2. Place a heaped teaspoon of the ingredients onto one of the wrappers in the centre. 3. Wet the rim of the lower half of the wrapper using your finger. 4. Fold the wrapper in two and then pleat from left to right across the top, making sure to firmly seal the top of the wrappers. 5. Bend the wrapper slightly so that it is in a crescent moon shape and so it can stand up unaided. Place to one side whilst you prepare the rest. 6. Using a large nonstick pan add a tablespoon of sesame oil and when hot add the dumplings so that they are standing up and not sticking to one another. Fry them for 3 minutes, by which time they will have bronzed underneath. If they have not bronzed sufficiently leave them to fry for a little longer. 7. Add 100ml of water to the pan and place a lid on the top. Leave to steam for a further 3-4 minutes so that the water has completely dissolved. 8. Mix the ingredients of the dipping sauce together and then place to one side in a little bowl. 9. Serve immediately with the dipping sauce. 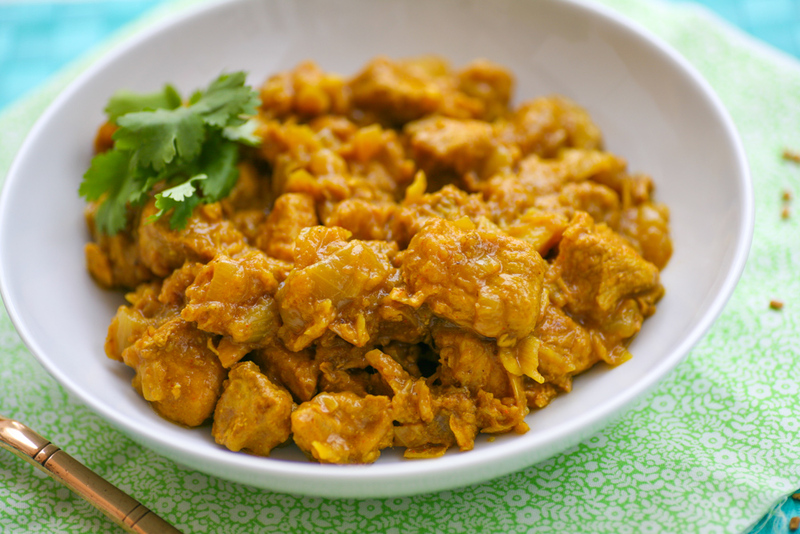 I haven’t posted an Indian recipe for quite some time so thought it would be refreshing to post one for you. 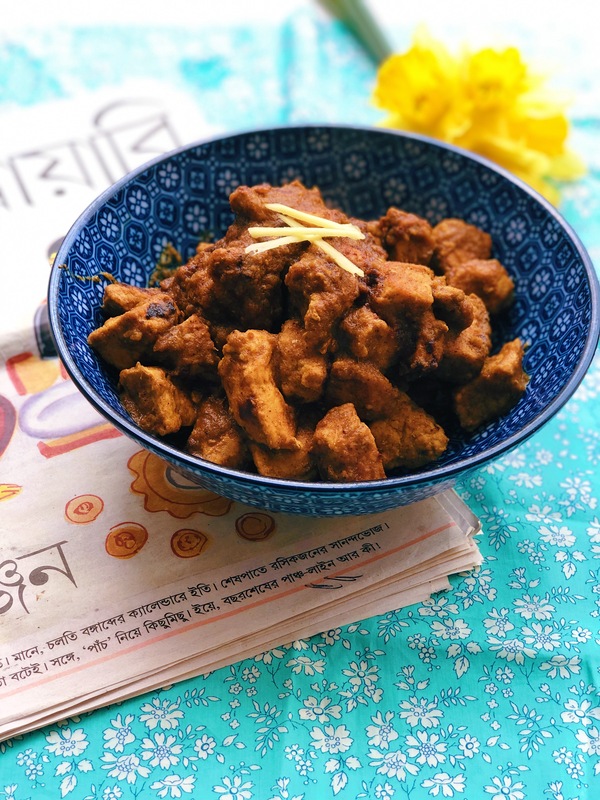 With all this deliciously hot weather we have been blessed with recently in the UK, cooking a pork curry is probably the last thing on your mind, instead opting for fish/salad type foods right? When the weather cools slightly then come back to this one as it is guaranteed to become a firm family favourite. 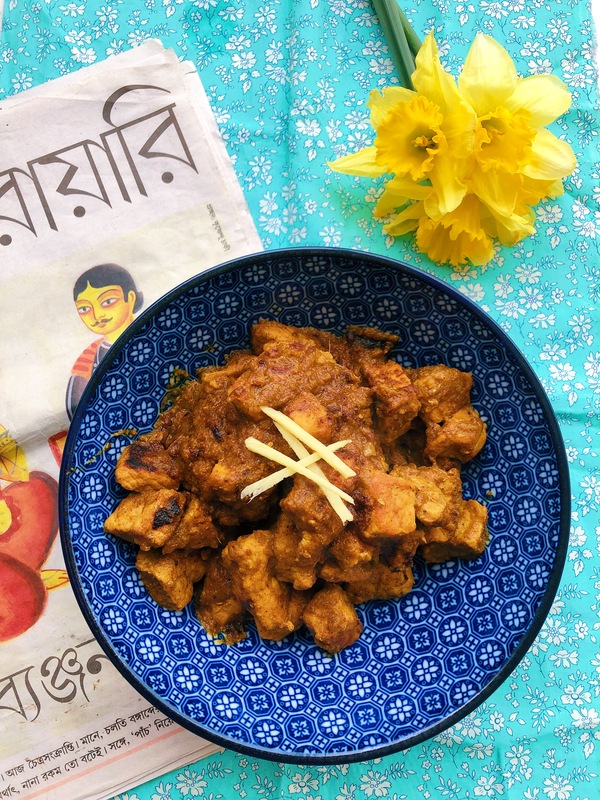 If you’re a bit of a curry novice in the kitchen then this curry is a perfect one to start your life long love affair with cooking Indian food. It require a lot of onions – that’s the Dopiaza bit (it actually means twice cooked onions) – and all the other ingredients are always in my store cupboard. If you are not very keen on things hot and spicy this also works well as it is very mild requiring only one teaspoon of chilli powder. 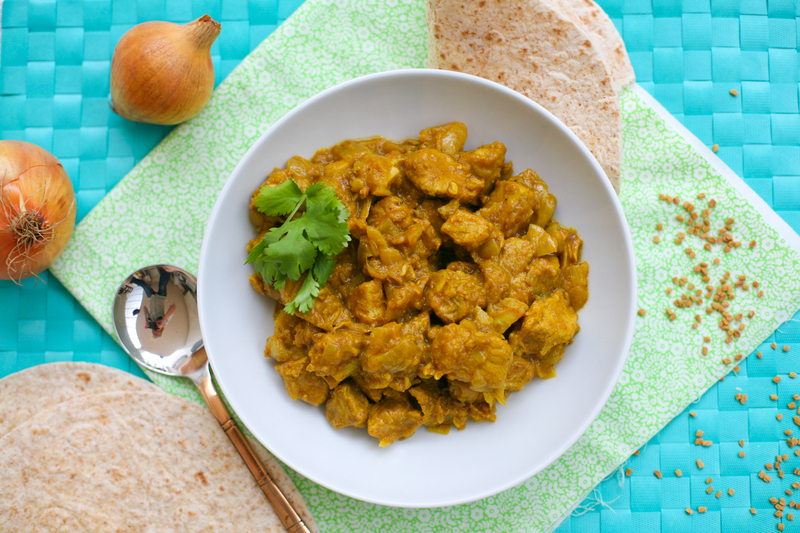 Enjoy the sun and hope this curry finds it’s way into your belly very soon! 1. Heat the butter/ghee in a deep pan and add the chopped onions (remember to keep back the sliced onions) and the lemon juice and cook gently for 15 minutes on a low heat until golden, stirring frequently. Remove from the pan and place to one side. 2. Using the same pan add the pork and increase the heat slightly so that the pork is browned on all sides. Remove from the pan and place to one side. 3. Continuing with the same pan (you may want to add a little more butter/ghee/oil) add the sliced onions, coriander, fenugreek, turmeric, chilli powder and salt and fry for around 10 minutes. Re add the browned pork and add a little cold water and gently cook covered on a low heat for 50 minutes. You may need to add a little more water if it begins to look to dry. 4. Re add the fried onion and cook for another 15 minutes continuing to stir. 5. Serve with rice or chapati and some fresh coriander. On a recent trip to Vietnam Mr B, Big A and Little Z (husband and two daughters) stopped off in Hanoi for a couple of days before heading south to Hoi An and it was during this stay I discovered a dish known as Bun Cha (pronounced Boon Cha – even the name of it appeals) that will stay with me forever. There have been certain times in my life that I have, often unexpectedly, had a meal that was off the delicious charts and consequently imprinted on my memory. This was one of them. We had booked ourselves onto a guided tour of ‘real’ Hanoi with Hanoi Kids – which I cannot recommend more highly if you are planning a visit. 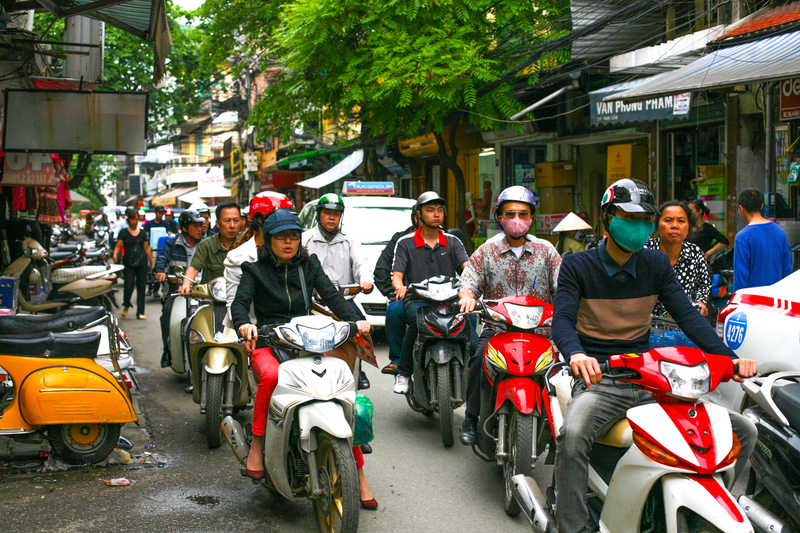 The personal tours are conducted by local university students who show you their beloved Hanoi. The hope is that the students can improve their English and you enjoy an original type of tour. The tours are free so it’s a win win for everyone, although it’s only polite to pay for their lunch and drinks and leave a tip at the end (although there is no pressure to leave one). Van and Nhung (our designated Hanoi Kids for the day) collected us from our hotel in Old Hanoi and after a few minutes discussion on what kind of things we enjoy doing they whisked us off to a few places they thought we should see, both on the tourist trail and the more hidden places. 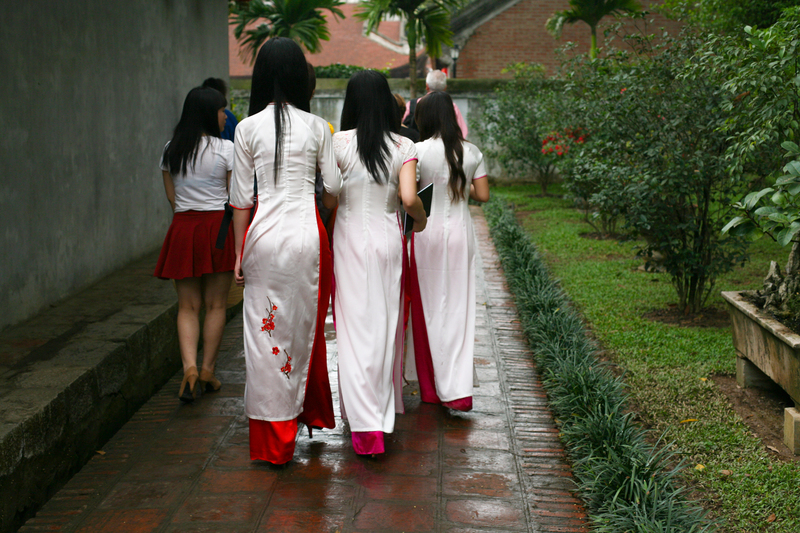 Despite the tourists who flock to ‘The Temple of Literature’, the site of Vietnam’s first university, the place was breathtakingly calm and serene as recently graduated students wafted around in their stunning ‘ao dai’ – the national dress for Vietnamese women. The temple is a place for them to take cherished photographs of themselves in all their finery having completed their studies; their graduation photographs if you will. We wandered around the large complex taking in our surroundings before heading back to the cool of our transportation and on to the next destination. After a morning of soaking up the some of Hanoi’s sites Van and Nhung promised to take us to one of their favourite Bun Cha establishments. New to Bun Cha we were open to their suggestion. 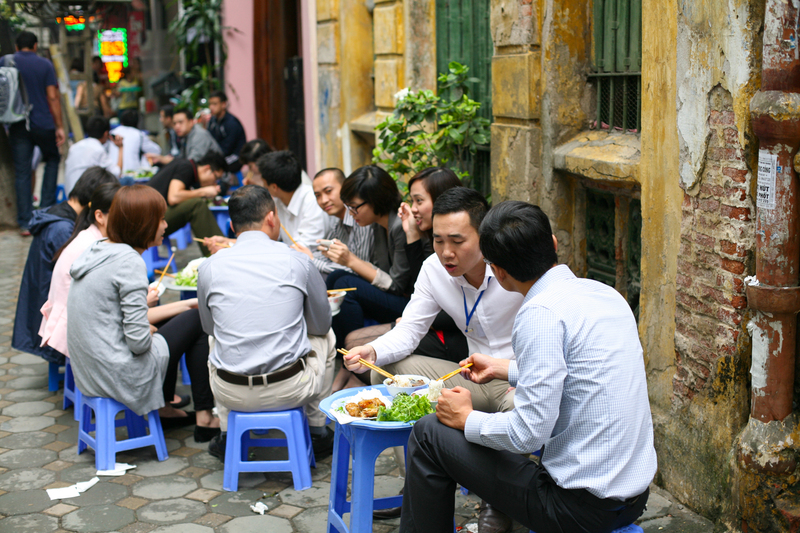 Our driver dropped us off by the pavement where we found a collection of little tables with miniature blue stools where local Vietnamese were feasting on Bun Cha. We were shown to a table and waited briefly for our meal to arrive. A large tin platter was placed on the small table, which we were huddled around and upon it were six bowls of broth filled with BBQ pork slices and patties. 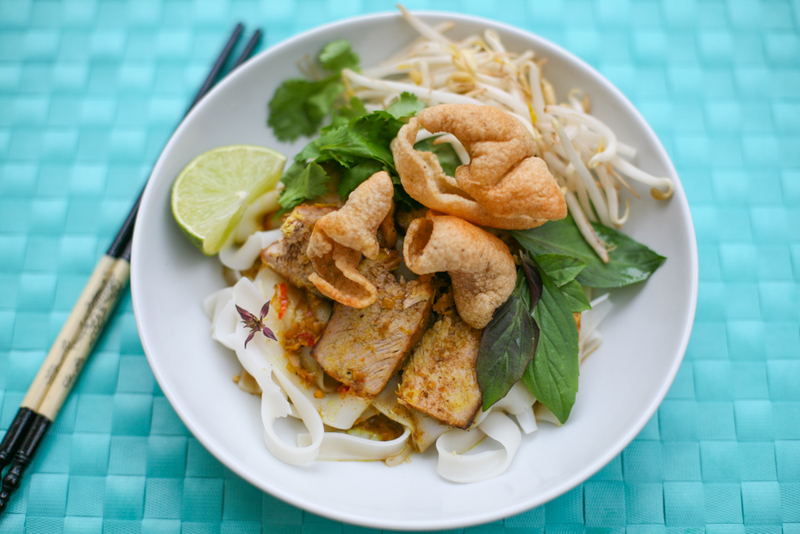 In the middle of the platter where mountainous piles of noodles, fresh herbs, lettuce and bamboo shoots. The simplicity of the spread did not reveal the resplendent flavours that came to the fore after the first mouthful. Without exception we were all in culinary nirvana; even Little Z who has not such a developed palate – being 3 yrs old – devoured every mouthful. The atmosphere of eating in a local eatery with traffic and bikes whizzing by only added to the charm. All the tables were filled with locals, not a tourist in sight (apart from us that is). At £2 a head it is without doubt the best cheapest meal I have ever eaten. If you are in Hanoi do check it out you won’t be disappointed. The address is : Bún Chả 34 Hàng Than, 34 Hàng Than, Hoàn Kiếm, Hanoi. The afternoon was spent on foot touring the streets of Old Hanoi,which is no easy feet I tell you. 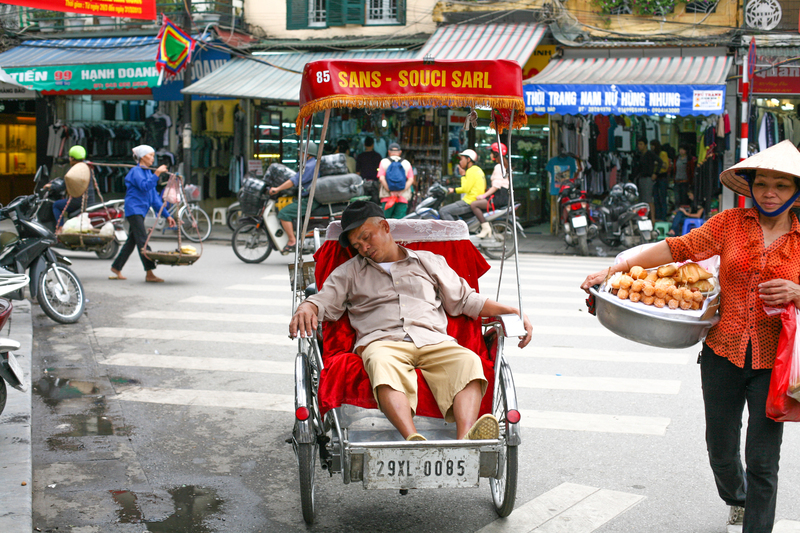 Crossing a road in Hanoi is a tricky business, but with our guides on hand we managed to stay alive to tell the tale. Some like to take a more leisured approach to daily life!! 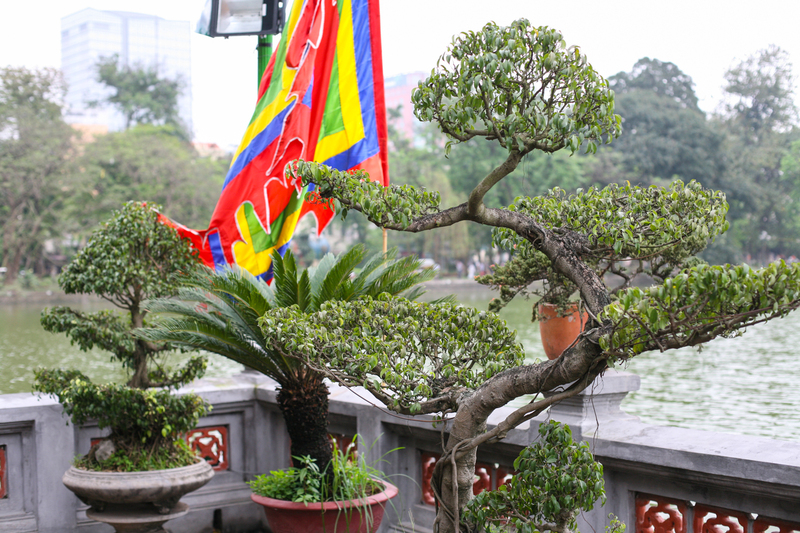 We ambled around Hoan Kiem Lake, which is the heart of Hanoi. Within the frenetic metropolis the lake offers peaceful walks in the relative shade of the tree lined walkways. We visited the temple in the lake and heard about the legend of the giant tortoise and the sword. The rest of the afternoon we spent wandering down the laberinth of narrow roads that make up Old hanoi, stopping off at temples and markets and of course sampling the famous egg coffee at Cafe Giang, a coffeehouse that’s been around for decades. (39 Nguyen Huu Haan) and is delightfully charming hidden down a dark little alleyway (we would never have found it without Hanoi Kids), over two floors scatted with it’s miniature tables and wooden stools, much to Mr B’s chagrin, as he is a good six foot tall. The girls loved it however as the seating arrangements in Hanoi were perfect for them. 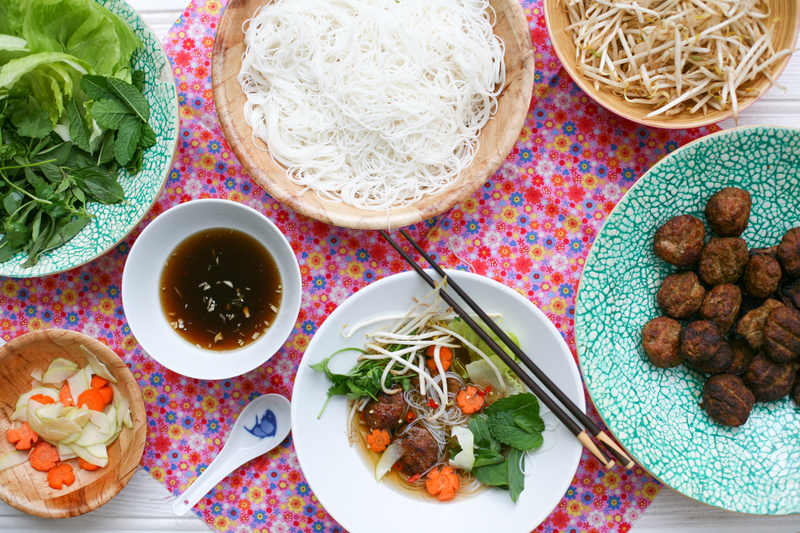 So for those who have no immediate trips to Hanoi planned, fear not, here is the simple but truly delicious Bun Cha recipe that you can make at home. Don’t be put off by the length of ingredients, it is far more straightforward than it may appear and if you don’t have all the herbs just use one or two of those listed. Equally if you find green papaya too hard to source just add carrot. Ideally marinate the pork mince and slices and leave in the fridge overnight if you have time/remember. Failing that a couple of hours marinating will also be sufficient. 1. In a mixing bowl combine the pork mince with HALF of all the ingredients in the ‘Pork Patties and Slices’ section. 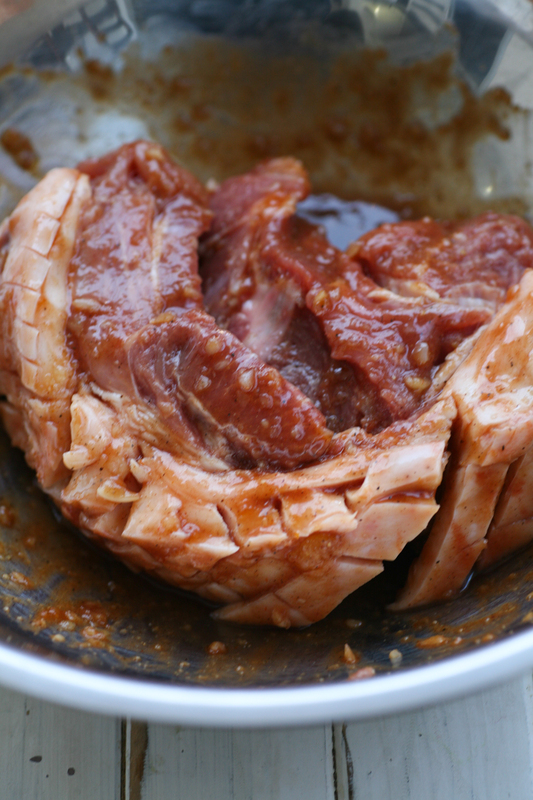 Thinly slice the pork shoulder to around 1/2 cm depth, 5cm length x 4cm width approximately. Place in a separate bowl with the other HALF of the remaining ingredients. Cover both bowls and leave in the fridge to marinate overnight or for a couple of hours. 2. Next prepare the side of pickles by slicing the carrots, or if you are feeling ambitious make little carrot flowers. Simply peel the carrots and then make V cuts lengthways, without going all the way through the carrot. This way when you slice the carrot horizontally little carrot flowers have been formed. Peel and slice the green papaya and then put both the vegetables into a bowl with the salt. Set aside for 10 minutes before rinsing off the salt in water. Drain thoroughly and then place in a new bowl with the sugar and the rice vinegar. Leave to rest for an hour. This will allow the vegetables to absorb the sugary vinegar flavour. 3. Prepare the dipping sauce by mixing all the ingredients together. Leave to one side. 4. Cook the rice vermicelli according to the packet – few minutes normally in boiling water. Drain under cold water and leave to one side. 5. After marinating the pork, make small patties using your hands, similar to how you would make meatballs. It is easiest to form the balls if your hands have a little oil on them. Once you have formed a ball, gently flatten the pattie so that it is easier to handle when cooking. 6. If you want to be really authentic then you could BBQ the meats but as it is not always BBQ weather here in the UK, I find the oven grill works equally well. Preheat the oven grill to 180 degrees (I use fan oven). Place the slices and patties on the grill rack and grill for just under 10 minutes (or until nicely turned brown) before turning and grilling for a further 10 minutes. It’s a great dish for people to help themselves so place the herbs/lettuce/bean sprouts, dipping sauce, side of pickles and noodles in separate bowls. To heat up the noodles simple pour boiling water over them and drain them thoroughly! Then place the meat on a separate plate. 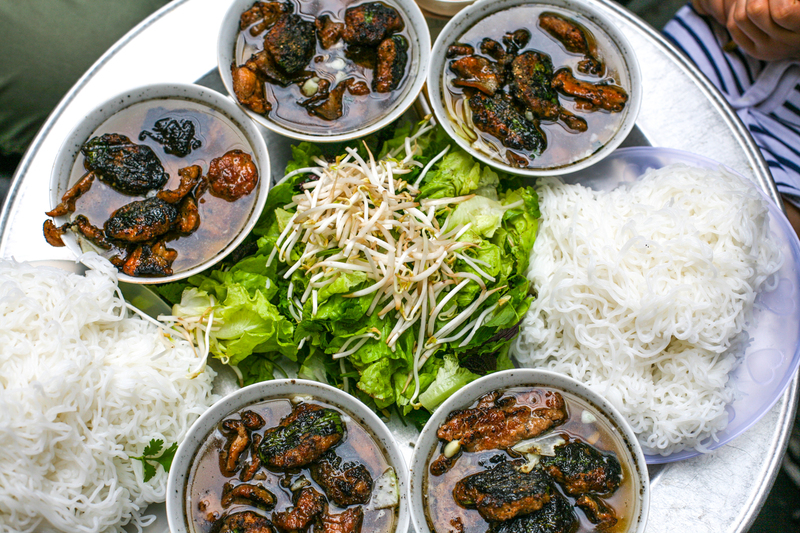 Ideally serve in small little round bowls like those served in Hanoi (see photo above). My bowls are a little too large really so aim for a small bowl if possible. Guests pour a little dipping sauce in their bowl followed by a couple of slices of pork and a couple of pork patties and pickles. 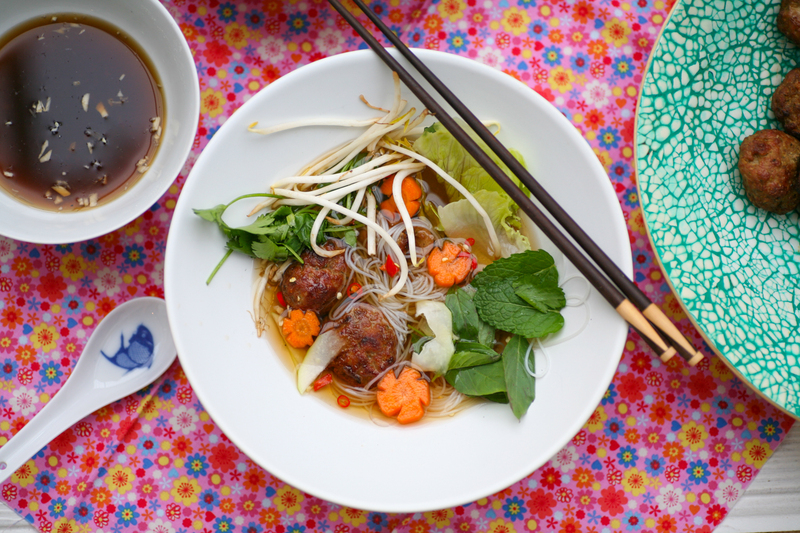 Then you dip a bit of vermicelli and fresh herbs/lettuce/bean sprouts into the bowl and then eat. The flavours and textures will sing to you and you will be finishing off bowls of the dish before you know it. 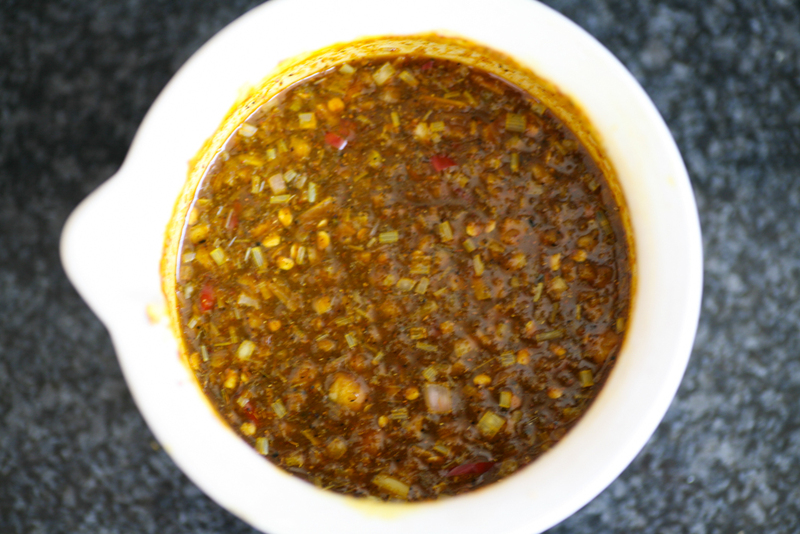 If you run out of dipping sauce it is easy to prepare a fresh batch. Both my hosts in Hanoi did not finish off the sauce as it is sweet, although I couldn’t resist finishing off every last mouthful.